Who is your inspiration? Is there a guiding force which inspires you to be a better person? Does anybody inspire you to work harder? The answer may be a family member, a historical personality or even someone you do not know. Have you considered nature as an inspirational force? For Frank Lloyd Wright, nature inspired him in a number of ways. He used to work in his uncle’s farm as a young teenager and enjoyed milking cows and growing vegetables. He learnt the deep mysteries and miracles of nature. Wright also learnt the importance of hard work and patience. 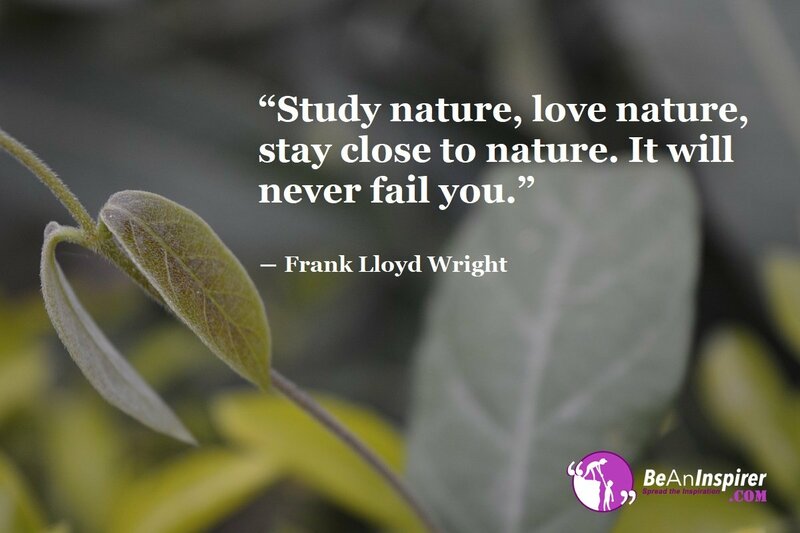 Frank Lloyd Wright advised students that they must study nature and learn to love it. He drew a lot of inspiration from his early days in his uncle’s farm. Nature is a vast phenomenon and it covers the trees, animals, plants, flowers, fruits, mountains, snow and everything that surrounds us. We learn so much from nature and the biggest lesson is that we get to know the importance of hard work and patience. How? When we sow the seeds in the ground, it does not grow in a day or a week, it takes time to grow. We water it, nurture it and the sun gives it warmth. We learn to be patience for the plant to grow. When we see the plant growing, we feel proud that the patience was worth it. It teaches us a lot about relationships. It takes time for a relationship to develop into marriage. We work hard each day, nurture and take care of each other. It is the investment of time and patience that we are able to build a successful relationship. A farmer spends considerable amount of time growing vegetables. We do not pay too much heed but all of the yummy vegetables and fruits in our refrigerator are due to their hard work. We must consider nature as an inspirational force because there is a lot we can learn from our surroundings. We learn about architecture through the bird’s nest or the spider webs. Wright took inspiration from nature and he used it in his buildings. We learn a lot about life through nature. Do you know that trees shed their leaves but they are not worried about it? Why is that so? Seasons change, trees lose their leaves but the tree knows that a new season would arrive and their leaves would come back. Just like that, there would be problems in life but it shall pass. You will learn to love again and you might crack another exam. Nature has a lot to teach us! Nature is the best teacher and it teaches us how to build a successful relationship, being patient, having a positive attitude and beginning yet again!